First things first: the name is misleading. 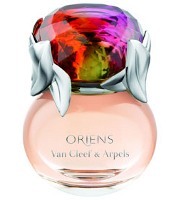 Van Cleef & Arpels Oriens is not an oriental fragrance. This Eau de Parfum is reportedly intended to evoke “the ever-changing mystery and magic of the exotic silk route to Asia,” and it's being billed as a “fruity floral chypre.” Created by perfumer Bernard Ellena, it features top notes of raspberry, black currant, and praline; middle notes of jasmine and fresh-cut white flowers; and a base of patchouli. The bottle’s designer, Joël Desgrippes, modeled Oriens’ flacon after a ring design from Van Cleef & Arpels' fine jewelry collection: an enormous tourmaline set in white gold, like a flower surrounded by diamond-studded leaves. (The perfume bottle mimics the gem's pink-orange-green spectrum, but wisely dispenses with the diamond detailing on the prongs). The press materials for Oriens note that there is “an oriental theme seen in many of the house’s rings,” but again, this information is somewhat confusing; this particular ring, rather than having an “oriental theme,” was created for the “Midsummer Night’s Dream” collection of 2003, which also offered the inspiration for the Féerie perfume bottle (2008). Van Cleef's original tourmaline ring is titled “Arbre aux Songes” (“Tree of Dreams”) which, come to think of it, would make a pretty nice name for this fragrance. Behind its flashy exterior, Oriens is surprisingly sweet and well-mannered. In its opening phase, a candied orange note is most noticeable. The white florals of the fragrance’s heart, despite their jasmine-centered claim, are airy and not at all animalic. The base, which gradually emerges and hovers beneath the long-lasting fruit notes, is a soft, dry cocoa with just a whisper of spice. If you’re not a patchouli fan, don’t worry; the patchouli is discreet and mild. (As Kevin recently noted, this is often the case in recent releases that advertise patchouli as a note). Nor, despite the Oriens press release’s description of this scent as a “fruity floral chypre,” does it register as a chypre. “Semi-gourmand fruity floral” would be a more accurate tag. While I was testing Oriens over a period of several days, I kept having the feeling that this fragrance reminded me of something else. I finally figured out what it was: Oriens seems like an older, more sophisticated cousin to Juicy Couture's Viva La Juicy (whose listed notes are wild berries, mandarin, honeysuckle, gardenia, jasmine, amber, caramel, vanilla, sandalwood, and praline). Oriens has a softer "voice" than La Juicy, and she probably owns more cocktail dresses than velour sweatpants. Her hair's highlights are expensively subtle, and while she does love to wear jewelry, it's more likely to be one "statement" piece (such as a tourmaline ring!) rather than a jingling assortment of charms. In short, Oriens may suit someone who is almost tempted by Viva La Juicy but would prefer something less flamboyant. In addition, Oriens could attract wearers of other fruit-flower-patchouli fragrances who are looking for something new to add to their scent wardrobe: it’s less sugared than Estee Lauder Pleasures Delight, brighter and fruitier than Ralph Lauren Notorious (another victim of the "wrong name" syndrome), and less musky than Tocca Cleopatra. If you’re really looking for something that evokes a traditional “eastern” fantasy, you might want to turn back to a classic like Yves Saint Laurent Opium or Guerlain Shalimar, or a more recent creation such as Miriam Mirani Aqaba, L’Artisan Parfumeur Safran Troublant, Chanel Coromandel, or yes, Montale Sweet Oriental Dream. If, on the other hand, you’re in the market for a new spring fragrance, and you think you’d like a vibrant fruity-floral with a subdued undercurrent of sugar-and-spice, Oriens might just take you on the right journey. Van Cleef & Arpels Oriens is available in 30, 50 ($110) and 100 ($150) ml Eau de Parfum; a matching body lotion sells for $55. Oriens is currently exclusive to Bergdorf Goodman and Neiman Marcus. Thanks for writing a great review Jessica. I’m a big tourmaline fan, but personally, I’d prefer the ring without the added diamond bling. But that’s just me. No comment of the newest entry into the fruitchouli category. Rappleyea, That ring must be massive (and very sparkly) in person! and I think we should start using “fruitchouli” as a search tag. 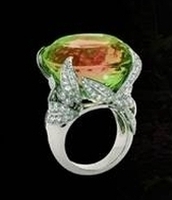 I’m a fan of tourmaline also Rapple – and I agree, that ring would be better to just feature that huge watermelon tourmaline stone and leave off the detracting diamond studded ‘leaves’. Tourmalines are my favorite stones! I knew you all were special…and very classy too! Although that ring is just too big….nice to look at , can’t imagine wearing it!! Tacky Person here. I love the ring, diamond-studded leaves and all. If only I didn’t have weird little Munchkin hands. Miss Kitty – I have small hands too, but that doesn’t stop me from wearing big stones! My all time favorite ring is an 11 carat iolite. It’s huge, but I love it. You go for it. I love tourmalines, too, but that stone looks too big for a ring! I don’t own any tourmalines, but I wouldn’t say “no” to a small one!! Jessica—they come in a wide variety of colors and they are very hard so they make perfect stones for rings! oh great, now I want tourmalines…..
Oh – no such thing as a ‘too big’ gemstone! HA I LOVE big ‘cocktail’ style rings – I wear them a lot. Don’t have a watermelon tourmaline yet though. I love the pink ones—-just gorgeous! Great thing about a VC&A review (and thank you, Jessica) is that it reminds us how relatively ECONOMICAL our perfume habits are! Daisy – my *cough50thcough* birthday present to myself was a pretty big copper tourmaline stone, which I had set into a ring. Really different color! You need some for your business. I’d love to see what you do with them. Rustic Dove – I agree about stone size and my ring finger size is only a 5! BTW, congrats on winning the sample! After my second divorce I had my wedding rings melted down and presented myself with a teal green tourmaline from my home state of Maine, along with a vow to be true to myself! love to try this to see if my ACK response to fruitchouli is accurate. Greenel, I love that story! an excellent use of those rings! “Fruitchouli” is definitely a contender for the perfumista lexicon! Didn’t someone here @ NST come up with that? Thanks for the review Jessica. Doesn’t sound like they came up with anything unique here. That bottle is SO gaudy that it makes me smile. Rusticdove, The bottle is wonderfully over-the-top! Look up Carmencanada’s review and the subsequent discussion of YSL Parisienne in Aug of ’09. You will see the origin of the term “fruitchouli” in one of the comments. Then you will see who started it in a moment of despair! Thanks Jessica. You read my mind because this was the fragrance I was very curious about. The bottle however creates some anxiety… how do you get the thing (top) OFF? VC&A seems to be stretching more with their bottles than with their juices, which does not impress. Hah… well, you just grab the “gem” and pull straight up! It pops off without any problem, but it’s pretty big! The bottle looks very sweet and simple without it. Hi Sarahbeth, the Collection Extraordinaire is more to my taste, in both its design aesthetic and its scents (esp Lys Carmin and Orchidee Vanille), but Oriens probably has broader appeal! Yes, and considering it is a bit less expensive too. For some reason, in aesthetic and pricing this reminds me of the release of B de Boucheron, with the green gem. Turin/Sanchez slammed that juice pretty hard (even though I got suckered in by the bottle). I wonder how Oriens will fare with those two. Does anyone know if they are going to come out with a second Guide anytime soon? There have been so many new perfume releases since their first, I feel the need for more guidance before making any purchases I will later regret. By the way Jessica, hello! I am new, but finally joined into the discussions after a couple of years of following this blog. A belated welcome! As for Mr. Turin and Ms. Sanchez, their Guide was recently reissued in paperback, with additions… see here: http://www.perfumestheguide.com for more information. They also sent out a few electronic newsletters, by subscription, with additional reviews, but I’m not sure how/whether those are accessible now. I remember an e-mail from the site saying no more newsletters would be produced, and the redesigned site doesn’t include any links to them . I -think- all the reviews from the newsletters were included in the new paperback edition you mentioned (so… I bought it, that means two copies of the book in a small studio apartment…). Also, just want complain briefly about the uselessness, to me at least, of the “fruity floral chypre” descriptor. It reads like everything-but-the-kitchen-sink! Thank, Kikilarue! I think you’re correct, on both points! I LOVE that bottle. Obviously would prefer the tourmaline ring given the choice……but would definitely have the bottle out on display and not in the dark cabinet of perfume treasures. The juice sounds eminently wearable. Sunsetsong, it’s definitely a bottle to display! and the fragrance is surprisingly easy to wear… I expected something much more dramatic, given the packaging! So, at those prices, Oriens is likely to appear in the department stores? I’m just trying to sort out where it fits in, cos I very curious to see the bottle (how does the cap lift off?). At my locals, all the VCA I every see is First, and some other thing – forgotten what (‘Second’?). Hi Annemarie, I’m not sure where it will go after its “exclusive” deal with Neiman/Bergdorf ends… Saks? Nordstrom? It’s definitely higher-end. The bottle *is* fun in person, and very heavy! I feel so cheated when something gets “chypre” tagged on it just because it has patchouli in it….and everybody has heard me ‘make verbal faces’ when raspberry shows up—-front of the line here–yikes! I’m afraid that the idea of a new “fruitchouli” doesn’t make me swoon (unless it’s swoon in a bad way due to the retchosity of raspberry) but I’m curious about that bottle… could be fun, could be outrageously tacky, but I do like a nice heavy bottle…. The collection extraordinaire was a hit with me….I have at least some of 4 of them…and I really like the bottles: they are substantial, simple and classic. I agree about the “chypre” label… just when I had finally figured it out, it started to mean less and less! “Retchosity”? Can I quote you? I agree Mals. And I especially like the alliteration of “retchousity of raspberry”. Great touch Daisy! yes, isn’t nice to know that I’ve made complaining into an art form?? The bottle looks cute – but does it look that nice in person? Or is it cheap looking? Not that it matters, I already have Pleasure Delight and if I were looking for another fruitchouli, I’d probably pick up Notorious for $19.99 at Marshalls. On another note – guess what I bought today? Halle Pure Orchid – Walgreen’s had it for $6.99 for the .5 oz, so I had to nab it unsniffed. It’s okay – it doesn’t make me want to saw my arm off like Halle did, but it definitely smells inexpensive. Cynthia, The bottle looks big (even in the 50 ml size) and substantial, although the “gem” is, of course, plastic… but it’s pretty nicely done, and I’m sure it was expensive to produce! lol – if they would have had a .5 oz of Halle for $6.99, I probably would have bought that, too. If I do test it again, it will definitely be in gold weather. The Pure Orchid is so sweet already, it does remind me of how overwhelming Halle was. But we have bigger perfume-fish to fry these days! You know, I really need to stop sniffing the spendy stuff. I find I love way too many of them. I need a graphic of all my $$ flying out the window…. It’s not flying out your window – it’s smeared all over your skin! LOL too true, Rapple! Too true! not flying out the window… I bet you smell great!! That bottle lid looks stunningly hideous. I can only imagine how much more tacky it would be in real life if it were made from plastic – the Versace bottles, anyone? I’m also surprised that “raspberry, black currant, and praline” don’t make for a more cloyingly sweet fragrance – would love to try this! Eminere, It’s still on the sweet side for many NST posters, I’d bet, but nowhere as sweet as it sounds! Hello, I want to start out by saying that I’m relatively new to this blog in that over the last few months I’ve read with great interest and excitement, many reviews and articles and have gained much insight in doing so. So from the get-go, I’d like to thank everyone for their knowledge and input. Years ago I was very ‘into’ perfume but decided to get rid of all of my perfumes when I discovered that there had been much research into the possible detrimental health effects that one could potentially experience from using perfume (or any product containing “fragrance” for that matter, since as far as I am aware perfume manufacturers are ’self-governed’ in that they do not have to specify exact ingredients in their labeling). Hi Laura, I’m not an expert on health issues or the chemical aspects of fragrance, so I’m probably not the best person to answer this… and a site more focused on health topics, rather than a news-and-reviews blog like this one, might be more useful for discussing this concern… but I do own and enjoy some natural perfumes as well as my conventional ones! LauraK, apologies: when I logged on, my response, now somewhere below, was disconnected from your post. I also agree with Jessica that there are many good health sites. Personally, I check the New York Times online health section regularly. It has cogent summaries on major health topics (hypertension, osteoporosis, etc.) as well as news articles. Laurak, you might want to check out this blog – the author focuses on organic/natural scents. I wish you luck finding something to wear and enjoy! Well LauraK I’m an ole tree-hugging greenie hippie and I would have to say that the amount of industrial chemicals that have permeated thru’ our environment make a little bit of fragrance, especially anything made with an emphasis on naturals, look like a drop in the ocean as far as contaminants go! Hopefully you are not having trouble eating or breathing or pumping petrol or using any cosmetics, dyes, plastics…anyway don’t get me wrong…but if you need to worry about something, have a look at what the agricultural conglomerates in cohorts with the chemgiants are doing to the human food chain!! Thanks for post. Of course what you say is so true. All of the things you have mentioned continue to occupy my thoughts. Try as I might to be well-intentioned, I am no saint, that’s for sure but I try to make as many eco-friendly choices as I can (although not enough, I know). I wouldn’t say that the issue surrounding perfume is a drop in the ocean though. Seems to me that if you include all the products containing perfume on the market today, that’s something on a pretty frightening scale. I know there are much bigger issues out there (of course) but I feel it’s good to keep an open mind about these matters. I agree with nozknoz that it is perfume is an art worthy of appreciation, it’s just that I personally want to do so with a little caution. Perfume is an art form worthy of appreciation. I’m not persuaded that perfume is at all risky – it seems as if the regulatory authorities are erring too far on the side of safety – but even if it were, why would we want to live a long life without beauty? Yes, well said…but if I didn’t worry about everything what would I have left to do? lol. Still, I really do believe the risks are high, it just seems like common sense to me. But I love being taken on a journey with fragrance so I am very keen to try out some natural ones and will start by checking out the website MALS86 suggested. Unfortunately for all of us there is number of dangerous contaminants in our air, water and topsoil that there is simply no escaping….so you do what you can, right? I’m an avid label reader myself—just a trip to the local grocery store frightens me!! But when it comes to “all natural” ingredients as opposed to synthetics in body products —I would very seriously recommend having a talk with a dermatologist. A few years ago my daughter and I were both having a LOT of skin irritation, it got so bad that I was worried we had picked up some fungal condition or something–found a highly recommended dermatologist who took one long look at our itchy patches and scalp etc. and then she said: you use a lot of “all natural botanical” type products? to which I said “yes!” , she handed me several photocopied sheets of paper with lists of products that were safer to use. Told me that the single most frequent set skin problems she saw was irritation and allergies caused by “botanical” ingredients which we are led to believe that they are better for us because they are “all natural” . Keep in mind that most botanical ingredients in body products are untested and unregulated. Just a word of caution. and apparently I have no sense of grammar tonight….sorry. Thanks Daisy. Yes, the ‘all natural’ tag is one to be weary of. I think it’s great advice to do your research and consult professionals. There are a few brands I trust but many others that I’ve also had issues with. It’s a tricky one. Well, I admit that I DO opt for the unscented versions of many products, such as unscented laundry detergent and deodorant, in the spirit of saving calories (chemicals) for dessert (perfume). Wondering if anyone has read this blog and has had the curiosity to question the safety and ethical nature of perfume manufacturing over the last few days? Prism, it’s striking, isn’t it?! i saw photos of the lid and it looks rather… disappointing. it’s beautiful in this shot cause the glass looks multi colored, but in other shots it’s only pink. Hi Prism, I’ve seen those other shots, and I’ve seen the bottle in person, and the photo we used is more accurate… the “stone” has three colors (pink, purple/fushchia, green). Jbsundries, It’s really eye-catching, and not likely to be confused with any other perfume bottle on one’s dresser!! I’d buy it for the bottle alone if I had the $$$ to spare! JB, I bet you’re not the only one who feels that way! They obviously put a lot of thought into making the bottle look so appealing! I lOVE the bottle….and the juice sound bearable and easy to wear, unless the juice is awful and the lid too “plasticky” in real life..I will have to have one..look at the colours in the lid and the balance of shapes…and I love the ring too..not for me, but to admire as a piece!!! Hongkongmom, It’s probably a matter of taste, but do take a look if you have a chance to see it in person! I’ve found what I think is perfume heaven…it’s called “Velvet and Sweet Pea’s Purrfumery” and the lady who creates these botanical perfumes is Laurie Stern. I’m yet to try her products but am so thrilled by her ethically and morally awesome philosophy to perfume making. Hi Laura, I haven’t tried this line yet, but I think Trish at the Scent Hive blog has written about it (www.scenthive.com). You might also want to register at http://www.Makeupalley.com, if you haven’t already, because their “Green Board” discusses natural fragrance on a regular basis. Good luck! I bought this perfume, on sight (unsmelled), because I loved the look of the bottle and because of the review. I personally think it smells like a VERY rich, older women’s perfume. (Of which I am neither). Chrissy, I’m sorry you bought unsniffed! I’d never recommend that! In any case, that’s an interesting reaction. I found it to be the “youngest” of the VC&A scents so far, except Feerie. I’d guess they’re aiming Oriens at 30-somethings. It’s certainly “younger” and brighter/sweeter than any of the classic Chanel or Guerlain scents, or something like Hermes’ Faubourg 24, which would be my picks for more “adult” or “affluent” scents. Then again, these categories are all very subjective. I dared to purchase this unsniffed and managed to snag the 100ml bottle that retails for $150 for $92 on eBay…no regrets here as it totally works on me, I love it and the bottle is a beauty – and quite hefty. Just like you Jessica, it jogs my memory of something I have smelled before, but for the life of me can’t conjure up what it is. Today I have it layered with EL’s Jasmine White Moss. Lovely combination for a beautiful spring day. Scentsappeal, I’m glad it worked for you! and glad you got a bargain! and I was like yeah the price will be too. it’s the same pricing as Chanel. the bottle itself is quite light, the tester didn’t have a top and it’s the top that’s heavy. I picked a box up to look at the price and nearly dropped it , it’s heavier than I thought. it’s very nice though, I wanted to spray it on Mum but she wouldn’t so I’ve only smelled it from the bottle. very fruity. hmm, I didn’t make the link to oriental from oriens and I didn’t make the link to Viva La Juicy and I tried that on my arm, though it does smell of orange or orange blossom to me. if you ever decide to get this fragrance, KEEP THE BOTTLE, it’s amazing, though I don’t think it looks anything like a flower. it’s cheaper than Féerie anyway, and maybe nicer. Hello Jessica, I just tried this here in buenos aires. It has been available for a couple of months already but i didnt have the chance. Your review is spot on! Just purchased this scent last night for my wife’s 60th birthday. Never actually put it up to my schnoz, but by the aromas that are contained within that beautiful bottle and tourmaline top, and the blog entries it garnered, I figured that it would be a sweet surprise for us both, upon uncorking. I introduced my wife to Guerlain’s Insolence a few years ago and she still cherishes it as her favorite. I figured that Van Cleef and Arpels has a great name and designs some fine jewelry, etc., so I really couldn’t go wrong. I know I’m late to this blog party, because the perfume was introduced a while ago, but I will have an update when the complex aroma fills our house. I hope she’ll enjoy it!! What a thoughtful birthday gift.